Air Systems® SVF-15ACAN AC Axial Canister Fan W/15' Duct InstalledAir Systems® AC Axial Canister Fan w/15' Duct Installed, Item # SVF-15DCAN, Air Systems manufactures a combination ventilation fan and duct storage unit to meet the most demanding customer needs. Our rugged polyethylene duct canister is securely attached to one of our industrial lightweight steel fans to make an ideal ventilator for the customer who wants a one piece ventilation package. •	Air Systems manufactures a combination ventilation fan and duct storage unit to meet the most demanding customer needs. 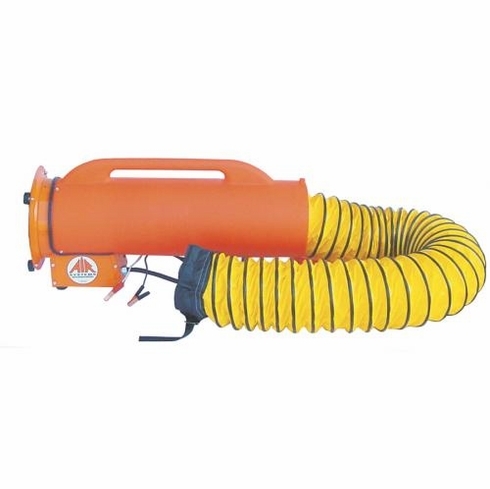 •	Our rugged polyethylene duct canister is securely attached to one of our rugged lightweight fans to make an ideal ventilator for the customer who wants a one-piece ventilation package. •	Comes in an AC or DC power version. Made in the U.S.A.
•	72 dbA @ 3 ft.
•	72 dbA@ 3 ft.